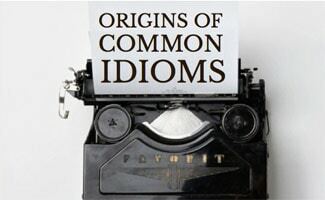 The origins of common idioms are as varied as the idioms themselves. Below we will take a look at the history of some of the world’s most popular idioms including: armed to the teeth, a backhanded compliment, to bleed like a stuck pig, blowing off steam and to chew the fat. An idiom is an expression or phrase that has a meaning that cannot be deduced from the expression or phrase itself. An example of this is the use of the term “chewing the fat” as a means to describe passing time. Idioms generally have culturally specific meanings. The term armed to the teeth is used to describe someone who is heavily armed. The origin of this phrase is Port Royal Jamaica from the 1600’s and is considered a “pirate” phrase. Since many of the weapons used by pirates at this time relied upon a single shot of black powder pirates would have to carry multiple weapons to protect themselves in a fight. Commonly one of these weapons was a knife that was carried between their teeth. A backhanded compliment is a compliment that insults the recipient at the same time that it is complimenting them. The origin of this idiom comes from the fact that the term “back-handed” is synonymous with something that is left-handed. Throughout history the left side of the body has been connected with devious or sinister actions as the Latin word for left is sinister. The idiom to bleed like a stuck pig is used to refer to someone who is bleeding heavily. The origin of this phrase comes from the slitting of a hunted pigs throat. Hunters cut the throat of a pig to hasten its death but it also results in a significant amount of blood loss. Blowing off steam is a phrase used to refer to someone who relaxes by enjoying mundane or “normal” activities. The origin of this idiom comes from traditional boilers that run on heated water that turns in to steam as it heats. Steam builds up in the boiler and so too does pressure and in order to prevent an explosion, a valve must be opened to blow off steam. The term to chew the fat is used to refer to people talking about mundane or everyday things. The origin of this phrase comes from the Inuit culture that used to chew on whale blubber. Being so thick, the blubber would take a long time to disappear. As they waited groups of Inuit would stand around and talk about anything and everything. The term clean bill of health is used to refer to people who have been found to be healthy by a doctor. The origin of this idiom comes from the days of sailing ships that carried and transported goods. Before a ship was allowed to dock or unload in a destination port it had to present a “bill of health” that proved that all aboard were disease free when they left their port of departure. This practice was implemented in order to reduce the spread of severe diseases and plagues that were carried from port to port by ship crews. There was one problem with this process though; it didn’t take in to account small rats and fleas that could easily stow away. The term cut from the same cloth refers to individuals that are similar in specific ways. The origin of this phrase comes from the fact that suit makers cut the trousers and jacket of a suit from the same cloth in order to have them match. The phrase down the hatch is used when eating or drinking. The origin of this phrase is sea freight when cargo was lowered in to the hatch to be stored below the ship’s deck. As this cargo is loaded it gives the image of the ship “eating” the cargo being loaded. Dressed to the nines is a phrase used to refer to someone who is dressed very well. It used to be said that tailors making more exemplary suits would use more fabric than they would when making lower quality suits. The amount of fabric tailors would use for the top of the line suits was nine yards. Face the music is a term used to refer to someone who must face the truth of a situation. The origin of this phrase comes from the British military when a drum squad would play music as an individual was court martialed. Someone who is said to be living high on the hog is someone who is living extravagantly or beyond their means. The origin of this phrase comes from the fact that the best meat of a pig is found on the top of the pig where the “scraps” are found at the base of the pig, for example, trotters. To jump on the bandwagon is a phrase used to refer to people who are doing whatever is popular or whatever others are doing. This phrase comes from a political age when political candidates would throw parades to drum up supporters. These parades would often include a band if the candidate was popular and someone who jumped to support this candidate was said to be jumping on the bandwagon. To let the cat out of the bag is to reveal a secret. This phrase comes from medieval times when con men would display healthy pigs for sale in the marketplace. As customers came by to purchase a pig they would receive their purchase inside a back and be told not to open the bag until they were home. The problem being that once the customer was home they would open the back and find a cat rather than a pig! This discovery of the cat would reveal the secret of the con man’s routine. It’s fun to learn about the history and original meaning behind common idioms we use today. Did you really know what these meant before reading this article? Probably not since the meaning was “lost in translation” in a way. Even though we don’t use these idioms for their literal meaning they still bring a lot to our language today. Check out this fun song about idioms. What other idioms do you know and/or use often?